The use of a rubber dam to obtain a proper operating field for direct gold restorations is imperative. The acquisition of a standardized technique eliminates the problems of excessive time for placement of the dam and of patient objection. 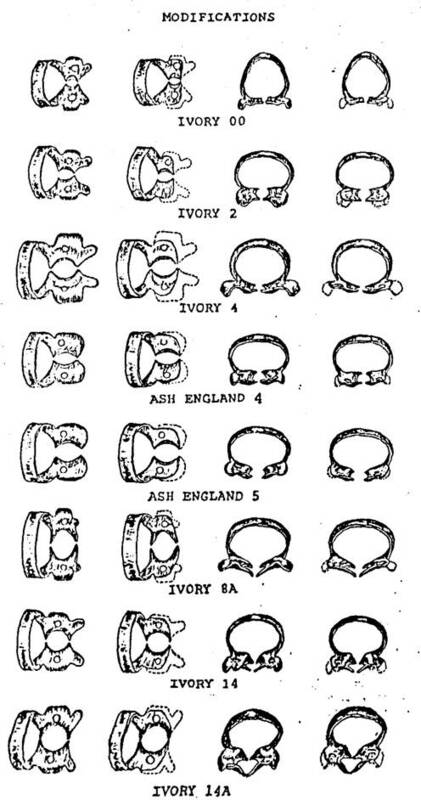 With such a technique, a dam can be placed easily in an average time of two to three minutes, including the placing and stabilizing of any necessary retractors or separators. The time between the admini­stration of the local anesthetic and the onset of effective anesthesia can be utilized by placing a dam and securing an op­timum operating field. 1. Assuming patient has recently received a prophylaxis, and that teeth are definitely free of calculus, plaque and stain, operator irrigates mouth with comfortably warmed mouthwash to thoroughly remove any superficial debris. 2. Operator receives floss from assistant to pass through contact points, noting degree of contact, and sharp edges which should be removed with steel strip. 3. Assistant, meanwhile, sets out on assistant's tray or table the rubber dam, dam punch, required retainer, retainer hol­der, soap, face pad and dam holder. 4. Punch necessary holes, usually 3.5 mm of rubber between holes. 5. Assistant applies protective cream, such as Lanoline, on patient's lips. (Just a thin film). 6. Hold dam, tissue side up, for assistant to apply lubricant to the punched section. 7. Place retainer in dam, if operating on posterior teeth. 8. Assistant passes retainer holder and steps to left side of chair. 9. Operator places retainer on tooth, assistant takes retainer holder, and operator slips dam over jaws of retainer and edge-ways through as many contacts as readily possible, assistant holding loose ends of dam out of the way. 11. Assistant hands dam holder to operator, opens folds of dam and holds edges of right side taut for operator to attach holder. (Upper clip is attached to uppermost corner of dam.) Operator passes holder around patient's head while assistant draws left side of dam taut for attachment to holder. Holder is drawn tight. Have elastic of holder at such a level on the back of the head (at or slightly above the lambda) that when tightened the holder will not tend to slip up or down, but remain steady. 12. Assistant stretches septa of dam over contacts strongly but without discomfort to the patient, using -"left side front" position for upper anteriors and all lowers, "left side behind" position for upper posteriors -while operator eases rubber through contacts with floss. 13. Place moistened saliva ejector of proper loop size for the mouth, through small slit cut in suitable location in the dam, so it will offer the least possible obstruction in the field of operation. 14. Seal is completed by averting the edge of the dam around each tooth with floss in the interproximal areas and with small burnisher on labial and lingual, while assistant dries teeth thoroughly with compressed air. The drying of the teeth is most important at this phase. NOTE: It is not necessary or advisable to ligate the teeth. 15. Any folds in the dam are eliminated by catching tucks in lower clip of holder, and if necessary a weight is placed by assistant. 16. Immediately apply coating of varnish (not vaseline) over all exposed silicate cements and porcelain inlay margins. 17. If gingival retractor is to be used, first remove molar or bicuspid retainer if possible, then place the gingival retractor and stabilize it with compound. 18. Proper field now presents and operation may proceed. 1. If chair is tipped back or if headrest is at other than a normal setting, reestablish normal operating position, advising patient of your intention to do so prior to actually doing it. 2. With water syringe and evacuator irrigate and rinse the field. With air syringe, blow out any remaining debris, and also blow loose debris off patient's drape so it will not fall on to clothing. 3. Have warm mouthwash ready. If equipment includes spray bottle connection, connect it. 4. Remove separator or gingival retractor (only), and rubber dam weights, if any. 6. Carefully stretch dam labially or buccally and occlusally to lift rubber septa free of interproximal tissues. 7. Out septal rubber, usually from buccal, with sharp liga­ture scissors or curved crown scissors held parallel with occlusal plane, being extremely cautious not to cut gingi­val tissues, lips, cheeks or tongue. Draw the cut portions of rubber to the lingual until free of the interproximal surfaces. 8. Then, and only then, remove the routine retainer if one is present. Hand it and retainer holder to assistant or place it on side table. Do not place it on operating tray. 9. While supporting dam in position with the right hand, unfasten dam holder from both sides, using left hand. Place holder on side table. 10. If necessary, caution patient against biting the teeth to­gether. 11. Carefully gather dam and pad toward the mouth area and into the right hand, at the same time wiping patient's face with the dry portion of the pad. 12. Flush mouth with warm mouthwash. Direct the spray first against the back of the retracting mouth mirror, then grad­ually bring it over to the site of the operation. Use enough solution so the patient has a reasonable quantity with which to irrigate the mouth. 13. Before discarding the dam, examine it to be sure that all of the rubber has been removed. 14. Carefully examine teeth and interproximal areas to be doubly sure that none of the dam still remains. 15. Loosen any remaining compound, carving trimmings, etc. from teeth and flush out all particles, repeating use of mouthwash as many times as may be necessary to remove all debris. Check with transillumination, especially under the free gingival tissue of the tooth operated on. 16. Treat any areas where retainer, retractor or separator has impinged on the tissues, by gentle massage with clean fingers and by the application of a mild antiseptic, such as Campho-phenique. 17. Irrigate patient's mouth again with mouthwash; be sure the mouth is comfortable, and the face free of debris. 18. Patient now is offered a hand mirror and shown the work which has been done, with whatever explanation and education is desired. Instruction in home care is given if necessary. 19. Chair is lowered and patient is dismissed. A minimum of 3 is required, with 2 being modified as described below. Three additional ones are a definite advantage (Figs. 1 - 5). Useful for gingival cavities in molars, but only after the bulk of the buccal jaw is reduced markedly, and its shape modified carefully, to fit the contour of the tooth (Fig. 6). 1. Provides proper visibility and access for gingival cavities, shoulders for porcelain veneer crowns, etc. 2. Retracts and protects gingival tissues. c. Prevents retractor from rocking on tooth root, thus avoiding damage of cementum and supporting tissues by retractor jaw. 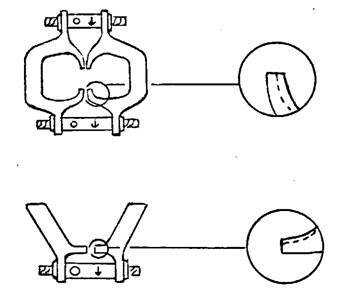 This retractor or clamp, designed by W.I. Ferrier, is the best one for most gingival third restorations, from the standpoint of providing a clear operating field, with minimal impingement upon the supporting tissues or damage to the tooth surface. It is excellent also for crown preparations on anteriors and bicuspids. To achieve maximum results with it, the principles and technique for its use must be understood and followed. The #212 retractor is designed so that, when positioned properly, it will closely approximate the labial supporting tissues and provide an optimal operating field. However, in so doing, it is an unbalanced instrument; that is, if it is placed on a tooth and not supported or stabilized, it will tilt so the lingual jaw slides gingivally against the lingual tissues and the labial jaw lies in a more horizontal plane thus re­ducing access to the area to be operated upon. Therefore, whenever this retractor is placed on a tooth, it must always be locked to position or stabil­ized with modeling compound, or the supporting tissues and cementum will be damaged. It is important that during the interval between positioning and stabilizing the retractor, it must be supported by a finger with pressure directed occlusally, or the lingual jaw will creep gingivally and the access to the lesion will not be as good as it could be. 1. The basic form of this retractor is such that, without modification, it will fit the great majority of teeth. Usually, however, some finishing must be done with each of the instruments as received from the manufacturer. The labial and lingual notches for the beaks of the clamp holder should be accentuated to ensure a positive grip (Fig. 1). It is also important that the edges of the end of each jaw should be smooth, polished and slightly rounded, so it will not scarify the tooth surface. The preferred finish for the carbon steel retractor is nickle plating rather than chrome, and satin rather than high polish. Compound does not adhere to a chromed surface as well as to a nickled one. If the retractor is made of stainless steel this can not be controlled. The reflections from a highly polished metal surface are annoying to an operator's eye. If a clamp is highly polished, it is improved by dulling the surface by sandblasting. 2. 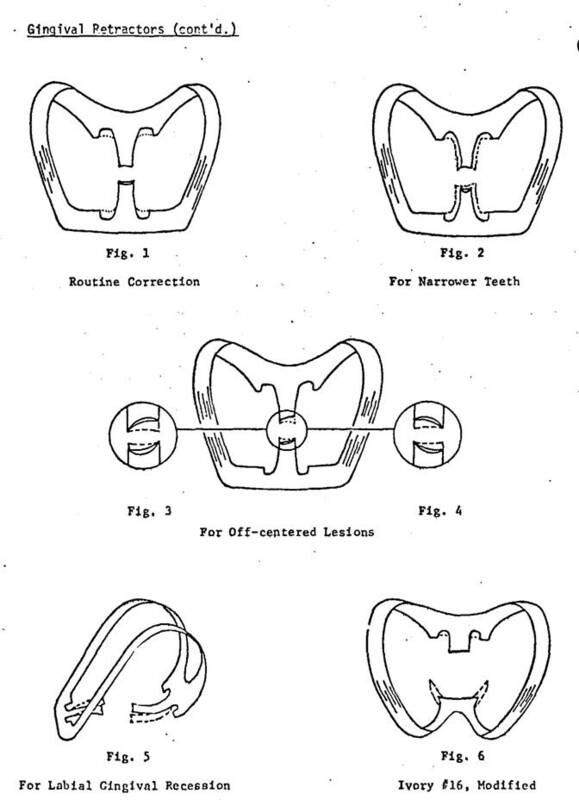 For teeth with lesser mesiodistal dimension, and more rounded labial and lingual root contours, such as lower incisors, lower first bicus­pids and some upper laterals, one retractor is modified by narrowing the labial and lingual jaws slightly, and by increasing the concavity of their edges (Fig. 2). The ground edges are thinned somewhat, then smoothed, rounded and polished before use. 3. For teeth with marked recession of the labial tissue, the lingual jaw of the retractor is bent more incisally and the labial jaw is bent a little further gingivally (Fig. 5). This is not an easy modification however, for if not performed properly much of the original advantage of optimal operating field access is lost. The more the labial jaw is bent, the less is the access to the operation. If the retractor is of stainless steel, bending is accomplished by holding the retractor near the lingual jaw with a pair of flat nosed pliers (e.g. #104); heat the lingual jaw in a high heat blowtorch flame until cherry red; quickly grasp the heated jaw with a pair of fine nosed pliers (e.g. #136) and carefully, but quickly, bend it occlusally to the desired extent (approximately 1 - 1.5 mm). Repeat the same procedure to modify the angle of the labial jaw; minimize the arc of the curve of the jaw; this is the difficult part. Bench cool the retractor (don't quench); then place retractor in a cool inlay burnout furnace and raise the heat to 500°F remove the retractor and quench in water. If the retractor is of carbon steel, heat and bend the jaws, in the same manner as above, but as soon as bending is accomplished. Bench cool. Repolish the surface with a Burlew disc. 4. To minimize loss of chair time, it is advisable to have two other retractors modified for teeth in which the lesion to be operated is off-centered mesiodistally. The alteration consists of grinding a bit of the left side of the edge of the labial jaw and the right side of the lingual jaw of one retractor (Fig. 3), and the opposite sides of the labial and lingual jaws of the other retractor (Fig. 4). 5. Another modification is that of annealing a retractor so it can be bent to fit any unusual case that presents. This is done by heating a retractor in a furnace to 1300°F. and then turning off the furnace to cool slowly. The instrument may then be bent at will for the case at hand. 2. For any degree of efficiency, it is necessary to have an assistant for this procedure. If a chairside assistant is not available then the patient's help should be elicited with essential briefing. 3. Until the operator is experienced, a gingival retractor is selected and carried gently to the tooth with the clamp holder, to test it for fit. If it does not fit, one of the modified retractors is tried. Further modification is sometimes necessary. The retractor is then set aside in readiness. 4. The dam is placed; then previously placed posterior clamps usually may be removed. 5. The gingival retractor is carried to the tooth with the clamp holder. 6. The lingual jaw is positioned first, as follows: It should be just gingival to the cingulum or lingual height of contour, so it will not slip incisally; it is usually carried to the level of the lingual soft tissue (if normal), but in no case is it set on the tissue, or on the dam. It is strongly supported in this position with the index finger, exerting pressure incisally and labially so the retractor will not slide further gingivally. This support must be maintained without interruption until the instrument is stabilized with compound. 7. With the dam retracted from the labiogingival area, the labial jaw is placed and carried gingivally very carefully, so as to retract the gingival tissue without tearing it. Retraction should be sufficient so an adequate amount of root surface is exposed gingivally to the anticipated gingival extension of the proposed cavity. 1mm is desired. 8. Usually the desired amount of retraction cannot be obtained this way without damaging the gingival tissue; therefore, the clamp holder is laid aside while the retractor is still supported constantly from the lingual, as described above; then with the ‘T’ burnisher in the other hand, the labial notch is engaged and the labial jaw is gradually retracted further, by degrees. With this “delayed “ retraction the gingival tissue will stretch without tearing. 9. The plane of the bows of the retractor should parallel the occlusal plane of the teeth. The labial jaw should rest snugly against the labial soft tissue. 10. The retractor is stabilized with red compound, always. a. Assistant softens about 3/8” of the end of a stick of red tracing compound by rolling it between the fingers over a flame until the compound begins to droop (be careful not to overheat, or the compound will drip on the patient or instrument tray); then temper it in a glass of hot water for about 5 seconds; then hand it to the operator who, after dipping his fingers in the water, twists off the required amount of soft compound (as little as will do the job). Note: With gloves on a little Vaseline helps to stop it from sticking to the gloves. Too much will inhibit sticking to the tooth. Painting the dry teeth with varnish also helps with adherence. b. Operator molds compound to somewhat pyramidal shape, touches the tip against the patient bib to dry the surface, then holds tip over the flame. c. Seared compound is applied under the bow of the retractor, introducing from the side of the bow furthest from the tooth to be operated as possible. Thee freshly heated surface of the compound is touched to the retractor and to the tooth to be sure it sticks. It is then molded to fill the space between thee bow and the teeth, and the interproximal spaces. d. Assistant chills compound with compressed air. Operator guides the air tip while assistant heats more compound to be similarly placed under the other bow of the retractor. e. Remember that at the conclusion of the operation, the retractor must be removed. This is facilitated if compound is not permitted to block the notches for the beaks of the clamp holder. 11. Be sure lip is not pinched under bow of the retractor, and that lingual jaw is not impinging on the dam. 12. A good field should now exist. The retractor should be firmly secure and should be usable as a definite finger rest. 13. When the operation is completed, the retractor and compound can usually be removed in one mass by carefully engaging the retractor with the clamp holder. Be sure the grip is sure. Gently stretch the retractor and lift it and the compound off, being careful not to mar the surface of the tooth or the restoration. Remove any traces of compound. 14. Remove the dam as usual; check the gingival crevice with an explorer, air and transillumination for complete removal of any debris. Gently massage the soft tissues and irrigate with warm mouthwash. An appli­cation of medication such as Campho-phenique is usually desirable. 15. If the retractor has been placed properly and if the instrumentation has been expeditious, the gingival tissues should not be torn or mutilated. The aim should be to conclude the sitting with no hemorrhage of the tissues and only an indentation from the jaw of the retractor on the unbroken soft tissues. 1. Produce slight separation of teeth. 2. Stabilize small or mobile teeth during operative procedures. 3. Retract dam and interproximal gingival tissues. 4. Distribute operating force to more than one tooth. 2. Jaws of separator may need to be thinned and sometimes require modification by grinding. When this is done, smooth and polish the ground surface before applying to tooth. 3. Be sure both adjustment screws work loosely. This property of "shake" is most important. If they are stiff, it is recommended that the instrument be returned to the manufacturer for correction. In an emergency, however, a paste of 303 and glycerin may be applied to the threads, and the screw worked back and forth until the necessary clearance is established, then scrub the threads clean, and dry. a. #1, 2 and 3 have adjustment screws of unequal length. The separator is designed for the longer one to be applied to the labial. b. Open the jaws enough so they will engage the teeth and not pinch the dam between separator and tooth..
c. Steady the instrument in proper position until it is stabilized with compound. d. The plane of the bows should parallel the occlusal plane of the teeth. a. It is preferable to have assistance at this stage rather than work alone. b. Assistant softens about 3/8" of the end of a stick of red tracing compound over gas or alcohol flame until the compound begins to droop; then tempers it in glass of hot water for about 5 seconds; then hands it to operator who, after dipping his fingers in the water, twists off the required amount of soft compound (as little as will do the job). c. Operator molds compound to somewhat pyramidal shape, touches tip against patient bib to remove water, then holds tip over flame. d. Seared compound is applied under bow of separator, touching some of the freshly heated surface to both separator and teeth. If possible, it is introduced from the side of the bow furthest from the operation, so the field will be neater. It is molded to fill the space between the bow and the teeth, and the interproximal areas, and smoothed. e. Assistant chills compound with compressed air, operator guides the air tip while assistant heats more compound to be similarly placed under the other bow of the separator. 6. The adjustment screws are carefully tightened with the wrench. a. Arrow indicates direction for tightening. b. Separation is achieved gradually, a quarter turn at a time, alternating between labial and lingual. Because of the spring in the bows, separating action continues after screws are adjusted. c. Be aware constantly of the degree of separation, and ease it as much and as soon as possible. d. Separation, excessive either in degree or duration, will damage the supporting tissues and will result in prolonged discomfort for the patient. 7. When removing separator, release tension of screws gradually, first one, then the other. If done rapidly, it will be painful. Be sure all compound is removed from the teeth. 8. Before sterilizing the separator be sure to remove all compound, and scrub points of jaws with soap and brush.